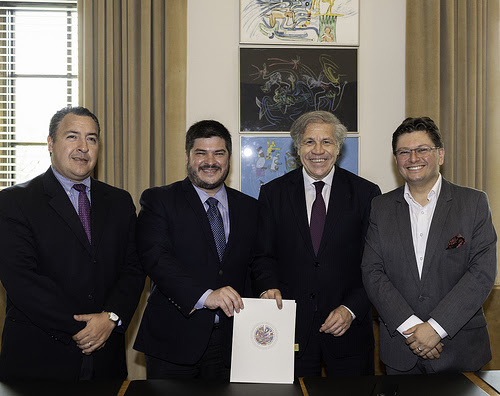 The Organization of American States (OAS) and the Regional Alliance for Free Expression and Information today signed an agreement to work together in the defense of fundamental rights such as free expression and access to information in the Hemisphere. Mauricio Alarcón, member of the Executive Secretariat of the Alliance said the slogan of the OAS of “more rights for more people” should be taken on by civil society. “At the Regional Alliance we have been working hand in hand with the OAS promoting freedom of expression and related rights, such as freedom of association and the situation of human rights defenders. With this agreement we will expand our work to defend these rights in the region," he said. For his part, the Secretary General of the OAS, Luis Almagro, said the agreement will strengthen the Organization´s early warning system for the detection of problems in sensitive areas such as freedom of expression and access to information, and highlighted the use of inclusive language by the Alliance. "We take a step forward in these areas, which are key to achieving more rights for more people," said the Secretary General. The Regional Alliance for Free Expression and Information is a civil society organization that brings together several organizations that work for freedom of expression in more than a dozen countries in Latin America.